Jaclyn Wright is an interdisciplinary artist and educator from the Great Lakes region. 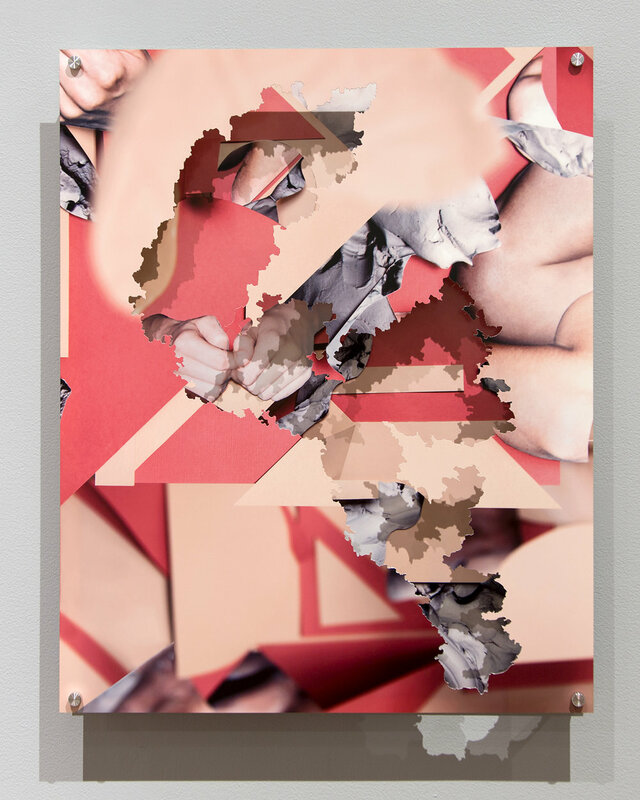 Her work combines traditional analog photographic techniques with contemporary digital methods and fabrication processes. Through this hybridized approach she draws connections between historical conceptions of photography’s material connection to reality and contemporary notions of its representational infidelity. In 2014 she was a visiting artist at the University of Cincinnati and was granted an artist residency at Latitude Chicago. In 2015 she served as the guest co-editor of Papersafe Magazine, “Turbulent Bodies / A Cross, A Wild Sea”. In 2016 Wright released her first monograph, “Afterglow: Compact, Orientable, Spacelike” which was included in the top ten artist books at LA Art Book Fair. In 2017 she wrote an essay and contributed images for the publication Too Good to be Photographed, which explores the various sides of photographic failure. Her work has been exhibited nationally and internationally and published widely. Recent and upcoming exhibitions of her work include: Utah Museum of Fine Arts (Salt Lake City, UT), RE: Art Show (NYC), Perspective Gallery (Chicago), Tiger Strikes Asteroid (NYC), Sala Muncunill (Barcelona, Spain), Filter Space (Chicago), David Weinberg Gallery (Chicago), and SCAD Museum of Art (Savannah, GA). Her work has been included in the collections at the the Art Institute of Chicago, the Museum of Contemporary Photography, and the Joan Flasch Artists’ Book Collection in Chicago, IL. She received her BA from Southern Illinois University Carbondale and her MFA from Indiana University. In 2018 she accepted a position as Assistant Professor of Photography & Digital Imaging at the University of Utah, College of Fine Arts in Salt Lake City. In this work, my birthmark is used to map the connection between bodies and their historical and political representations. From a young age, I have had a birthmark that covers a large part of the right side of my neck. It is often assumed to be a sign of domestic abuse or promiscuous sexual behavior by adult strangers. Interpreting this as a sign of submissiveness these individuals feel comfortable crossing boundaries normally in place between strangers, creating a power dynamic in which they feel it permissible to touch, grab and publicly ridicule my body. I’m interested in the origins of these assumptions and how representations of the human body can inform and encourage these kinds of asymmetrical power structures. The photographs are created from installations built specifically for the camera. They are constructed out of various materials including photographs, paper, latex paint, clay, etc. 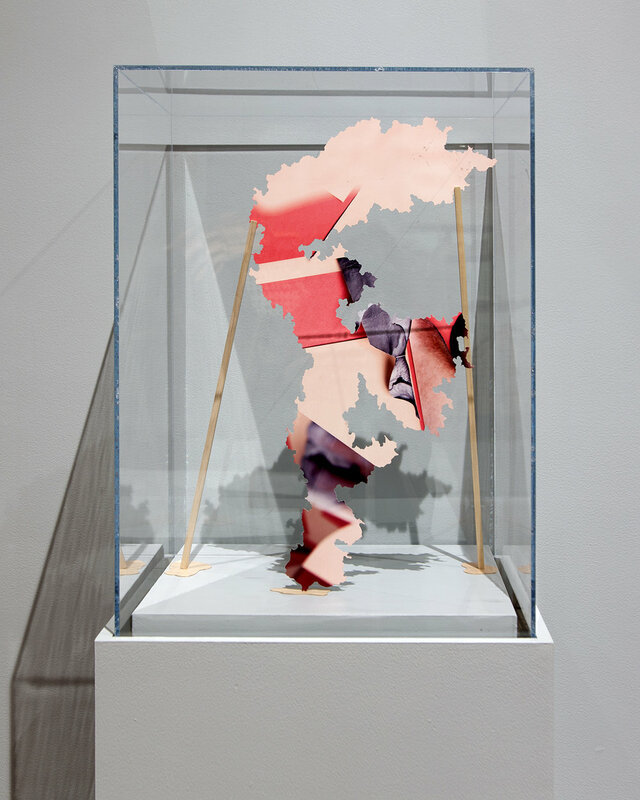 Three-dimensional forms are created with these materials, only to be re-flattened and force perspective through the photographic process. Using a single sheet of 4x5 film, a large format view camera creates layered exposures through in-camera masking. The in-camera masking is created using dark slides, which are meant to protect the film from light. The dark slides are cut with a laser cutter to create the masks, rendering them non-functional. Digital images are treated similarly through post-production fabrication. They are printed using dye sublimation onto aluminum, fabricated with a CNC router, and overlaid onto a separate dye sublimation piece, mimicking the masks used to shoot the film. The residue left by the masks and fabrication processes form a cycle that symbolizes and parallels the trauma experienced by victims of asymmetrical power structures. The work reduces the body to skin tone, gender, and flesh as a way bring attention to the dehumanization of the body by perpetrators of violence. By reducing the body to these simple forms the work becomes further aestheticized. This aestheticization is a final form of objectification, the body as object, the object as something that is silent, passive, and unable to give consent. The University of Utah is a public research university (R-1) located in Salt Lake City. As a tier one university, the U has funding opportunities for both undergrad and graduate students, offers BFA and MFA degrees, and a photography minor. Our facilities include darkrooms, digital space, a mural printer, and a lighting studio, with additional access to other departmental facilities. The BFA program begins with eight, eight week foundation courses. The foundation program was recently restructured to give students a well-rounded and interdisciplinary start, allowing them time to experiment with various mediums (including photography, 3D, film, animation, etc.). Graduate students are accepted into the MFA program with a specific emphasis. However, once they are at the U they form a singular cohort, which promotes interdisciplinary pursuits and provides them with a wider range of perspectives from various disciplines. The state of Utah is, in and of itself, an incredible space to make work. Utah is a geographically diverse place that sits at the convergence of the Rocky Mountains, the Great Basin, and the Colorado Plateau. The convergence of landscapes provides endless visual opportunities ranging from the sublime mountain and desert landscape to the martian terrain of the Great Salt Lake. The U has connections to several field stations throughout the state that support and encourage student research within these various biomes. Utah has five national parks, various state parks, and national monuments, including politically contentious sites like, Bears Ears. Further, Utah is connected to the history of Land Art and is home to works by Robert Smithson (Spiral Jetty), Nancy Holt (Sun Tunnels), and The Center for Land Use Interpretation, all within driving distance of Salt Lake City. Salt Lake lies between the Wasatch Mountains and the Great Salt Lake and is rapidly expanding. The Utah Museum of Contemporary Art (UMOCA) and Utah Museum of Fine Arts (UMFA) provide many opportunities for artists and Salt Lake is a great place for artists to create DIY spaces. I teach a range of courses including foundations, studio lighting, medium and large format cameras, color concepts, and advanced studio practices. All courses have a reading component which provide students with a theoretical framework and understanding of historical and contemporary works of art. Projects are conceptually driven and open-ended to allow students the flexibility to explore various technical approaches and creative research specific to their interests. Advanced courses include collaborative assignments, book-making projects, and interdisciplinary approaches to art-making. As a new faculty member, my current interaction with the graduate students is through studio visits. The grad seminar is rotated throughout tenure-line faculty in the Department of Art and Art History, providing the grads with a wide-range of expertise and experience. Photo BFA’s are required to take both darkroom and digital courses, which include alternative processes, darkroom techniques (35mm - 4x5 film), studio lighting, digital practices, and advanced project courses. In advanced courses, students are allowed to choose their preferred medium which can range from 4x5 view cameras and scanning to digital, video and time-based works to the exploration of virtual reality and 3D printing. Students are required to make prints for critique, whether in the darkroom or through digital output. We discuss the photograph as an art object and the importance of the printing process and exhibition quality work and framing techniques. Students are asked to consider how the output of their work informs its content and the viewers interpretation. For example, if showing the work on screen further informs the content then the work should be shown digitally instead of as a print. Critiques are a integral part of the course structure and all projects culminate with group critiques. We approach critiques with the describe, analyze, and interpret method but the critique strategy changes throughout the semester depending on what best serves the class dynamic. While I facilitate the critique, students are encouraged to view them as a space for collaboration between the artist and the viewers. This tactic is meant to promote accountability and community amongst the class, which often leads to a more open and constructive discourse.